Even though the United States has reduced the number of warheads deployed on its long-range missiles and bombers, consistent with the terms of the 2010 New START Treaty, it also plans to develop new delivery systems for deployment over the next 10-30 years. The 116th Congress will continue to review these programs, and the funding requested for them, during the annual authorization and appropriations process. During the Cold War, the U.S. nuclear arsenal contained many types of delivery vehicles for nuclear weapons. The longer-range systems, which included long-range missiles based on U.S. territory, long-range missiles based on submarines, and heavy bombers that could threaten Soviet targets from their bases in the United States, are known as strategic nuclear delivery vehicles. At the end of the Cold War, in 1991, the United States deployed more than 10,000 warheads on these delivery vehicles. With the implementation of New START completed in February 2018, the United States is limited to 1,550 accountable warheads on these delivery vehicles, a restriction that will remain in place at least through 2021, while New START Treaty remains in force. At the present time, the U.S. land-based ballistic missile force (ICBMs) consists of 400 landbased Minuteman III ICBMs, each deployed with one warhead, spread among a total of 450 operational launchers. This force is consistent with the New START Treaty. The Air Force is also modernizing the Minuteman missiles, replacing and upgrading their rocket motors, guidance systems, and other components, so that they can remain in the force through 2030. It plans to replace the missiles with a new Ground-based Strategic Deterrent around 2029. The mssile submarine fleet currently consists of 14 Trident submarines. Each has been modified to carry 20 Trident II (D-5) missiles—a reduction from 24 missiles per submarine—to meet the launcher limits in the New START Treaty. The Navy converted 4 of the original 18 Trident submarines to carry non-nuclear cruise missiles. Nine of the submarines are deployed in the Pacific Ocean and five are in the Atlantic. The Navy also has undertaken efforts to extend the life of the missiles and warheads so that they and the submarines can remain in the fleet past 2020. It is designing a new Columbia class submarine that will replace the existing fleet beginning in 2031. The U.S. fleet of heavy bombers includes 20 B-2 bombers and 40 nuclear-capable B-52 bombers. The B-1 bomber is no longer equipped for nuclear missions. This fleet of 60 nuclear-capable aircraft is consistent with the U.S. obligations under New START. The Air Force has also begun to retire the nuclear-armed cruise missiles carried by B-52 bombers, leaving only about half the B-52 fleet equipped to carry nuclear weapons. The Air Force plans to procure both a new longrange bomber, known as the B-21, and a new long-range standoff (LRSO) cruise missile during the 2020s. DOE is also modifying and extending the life of the B61 bomb carried on B-2 bombers and fighter aircraft and the W80 warhead for cruise missiles. 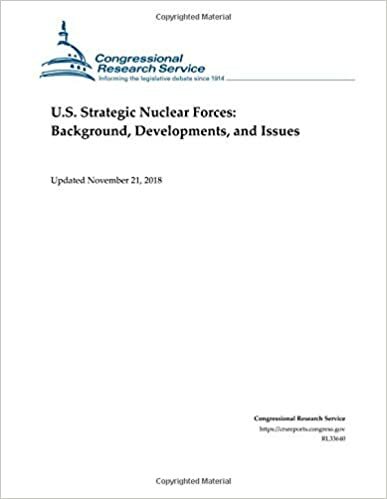 The Obama Administration completed a review of the size and structure of the U.S. nuclear force, and a review of U.S. nuclear employment policy, in June 2013. This review advised the force structure that the United States will deploy under the New START Treaty. The Trump Administration completed its review of U.S. nuclear forces in February 2018, and reaffirmed the basic contours of the current U.S. force structure and the ongoing modernization programs. The Trump Administration has also called for the development of a new low-yield warhead for deployment on Trident II (D-5) missiles. Congress will review the Administration’s plans for U.S. strategic nuclear forces during the annual authorization and appropriations process, and as it assesses the costs of these plans in the current fiscal environment.